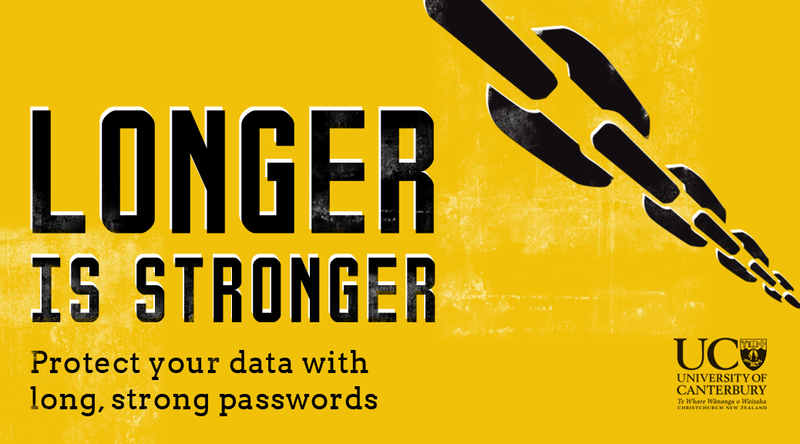 It’s simple, the longer your password is the stronger it is. A password of 12 characters is estimated to be 13 million times stronger than an eight character password and a 16 character password is estimated to be over 166 trillion times stronger than an 8 character password. At UC we recommend you use passwords of 10-16 characters in length for UC systems. But let’s take a minute to talk about passwords. Exciting isn’t it? Do you use a key for your front door? Are you happy giving it to strangers? No? This is the same thing, so it’s an important conversation and worth having. Being digitally security-aware is just as important as being home security-aware. Why? Some accounts are more important than others, especially your work and your bank, so have individual passwords for them, and then one more for your password manager. Longer passwords are stronger passwords – as long as you stick to the rules above too. Are you using the same password for everything? It sounds like a clever strategy to avoid forgetting which is which, right? But have you noticed how those online security breaches just seem to keep happening? Using the same password means that if it falls into the wrong hands, then that person has your password to everything. It’s worth taking a moment to think about what that could include.